I woke up around 2am and couldn’t go back to sleep so I got up and did the report for day 1. At 6am, I went to disturb the others. The day’s plan was to head out by 11am, (Bida is a short ride naaaa shior!). We went to have a sumptuous breakfast ☕ provided by INFINITE Riders Kaduna. Breakfast done, we gathered around the bikes and gisted as more local bikers arrived and the bikes with issues were being sorted – one bike was leaking oil, another had run into a pothole and the impact had broken the pillion foot peg, disengaging the exhaust, and yours truly -Godwin – had a busted front shock. Apparently on the way from Jos, while staring at the scenery, I rammed into this sinister pothole, then, I thought my rim had bent but it was the front shock absorber that took the brunt. What to do? Options: 1. Pack up and truck the bike to Lagos 2. Dismantle and have it fixed 3. Deploy Hunta to the next stop and truck Godwin home, or just ride on with the psychological trauma…what would you do? Went back to the room to chill some more and at about 12.30, we finally re-assembled and were ready to roll! 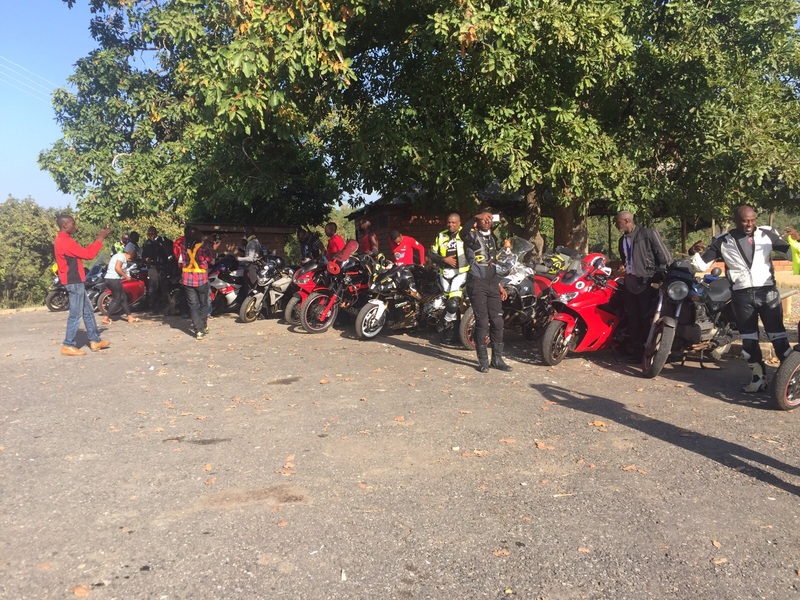 Some bikers had already migrated to Kaduna to join the RR, bikers from SOUL MC Abeokuta -Rex & Doya; and BICNIS BIKERS Sokoto- Naib01. 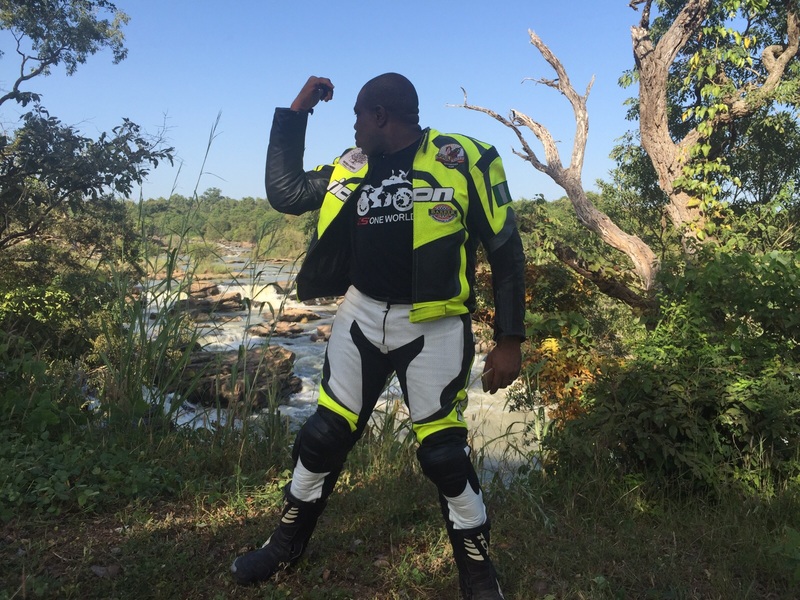 Also from INFINITE Riders was Abdullahi, with his 1970s K100 (vintage). 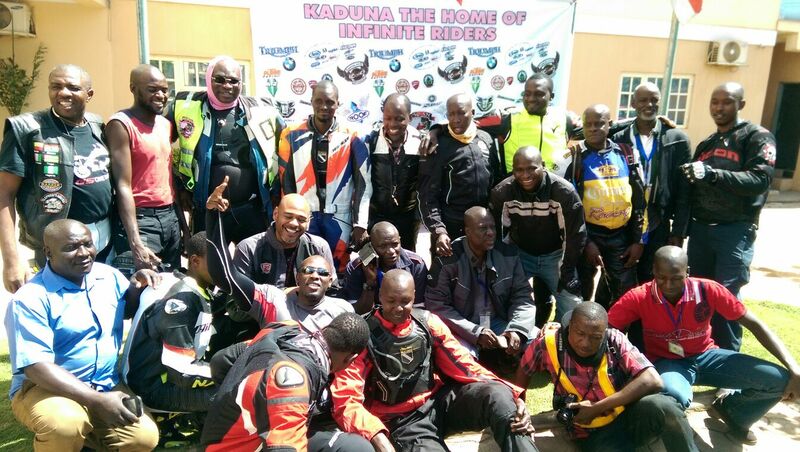 Gathered together, we had the brief, ride numbers given to the new guys joining, distribution of the RR pack, said our prayers and headed out with the Sardauna leading. We had 5 Infinite bikers as escorts and they saw us off to the city gates. We fueled at a Conoil station⛽ along the expressway and proceeded towards Bida the home of Brass and Bronze. Ride formation on the Kaduna-Abuja expressway was smooth and constant. 2doer and Fuego – the filming crew – were busy ensuring the tour was captured. With 2doer going ahead and laying down in the bush for the perfect shot angle! 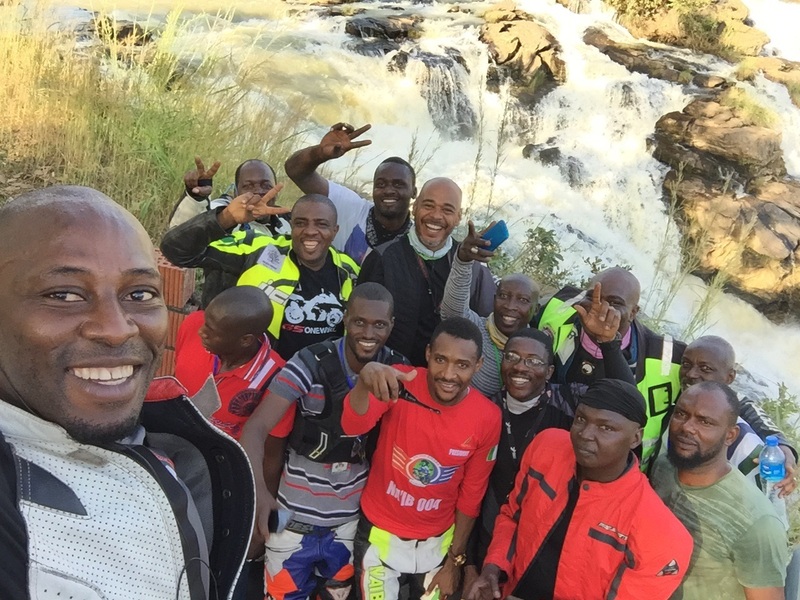 Ride progressed at a steady pace to Dikko junction along the expressway, where we turned in to Suleja-Minna road. Two kilometres in, Sardauna led us into this NNPC station⛽ where again we were given the VIP treat! Tanks filled, prayers completed, we set out to Gurara falls. We got to the falls, appreciated mother nature in her glory, even seeing a rainbow formed at the bottom of the falls! Sadly we were not allowed to swim, because the rocks looked angry, and there were no life guards. Pictures taken, water break, we saddled up and roared on to Minna. Suddenly, we found ourselves in the middle of an obstacle course designed by either the state or local government! Now I’d noticed that bikers ahead of me would indicate a pothole by kicking a foot towards the direction of the pothole, but by the time we were fully in the course, it looked like they were tap dancing! Seeing that we weren’t sweating it, the organizers increased the intensity of the obstacles and all men had to keep their feet on the foot pegs else you’ll fail the course with a bent rim or busted shocks or worse etc. 30km to Minna, and the road became normal again and sanity returned. I took point as we entered the Power State, and led the posse to my house to see my Dad. He was pleasantly surprised and strangely excited. 10 minutes with the best dad in the world and we rolled out. Having fueled at Suleja, we stopped for prayers and and hooked up with our man on ground from Bida, Daniel and his friend Mark. Daniel drove his car from Bida to meet us in Minna with his Sidi boots (small crase dey worri bikers o!) while Mark rode his bike. We all set out to Bida around 6pm. The trip to Bida was about 98km so we reckoned we would be done in an hour. We didn’t know that the FMW&H had prepared another course with craters, empty swimming pools and mother nature told them to have an early night. Sardauna and the front team rode on like horses in a war while some of us behind were cursing and swearing, until Daniel came to our front with the car and led us. 40km to Bida the the madness ended and we sailed smoothly into Bida. We entered Bida majestically, yet, seriously fagged out. Daniel took us to the prearranged hotel…after entering the small hotel with fanfare and video recording, we were told there were no rooms…oops! Na so we quietly remove ourselves o! This was about 8pm. 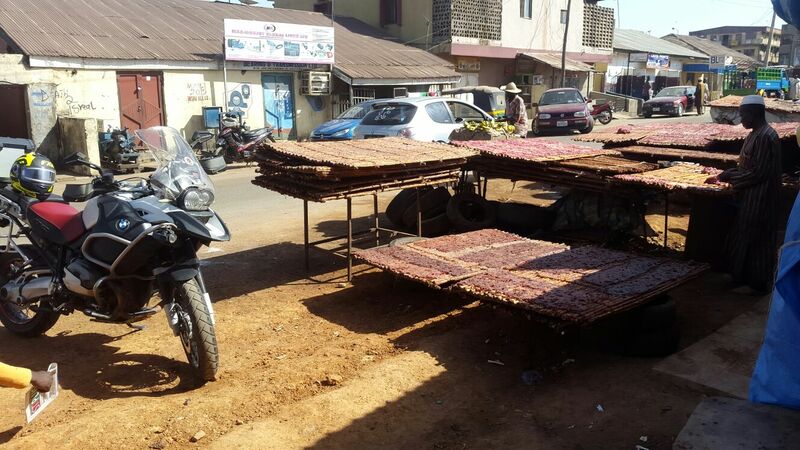 We moved to the next hotel and realised there was a function in Bida and hotel rooms would be scarce. We gently parked our bikes, removed helmets and jackets and prepared to camp on the hotel ground (it would actually help us leave sharply the next morning) we then ravaged the suyaman’s joint buying every edible meat in sight including massa, sat down by the road and ate to satisfaction. Daniel went round to seek out another hotel, and he got back saying that he’d found only four rooms and one presidential suite. So we all agreed on a sharing formula and rode there. Sardauna took one and offered to share, the SOUL guys took another, Chuka took one with his driver, and we took the suite. Two guys went out to the outskirts to camp out in the moonlight. Another hotel was got and the rest of the posse went there. Our sleeping arrangement hmmmm…it was decided that Godwin & Smilyn being the babies and still growing should take the bed, whilst Ripple & 2doer took the couch! What love shown! We settled in, sat in the living room and gisted then Sardauna came and gist continued. It was a warm and pleasant feeling to just sit down with men in boxers and fat tummies and share stories, jokes, tales and laughter about the whole day! Last I saw before going to bed was Ripple in longjohns looking like an adult teddy bear with his white goatie! Lol!!!! Thanking God for another great ride!